It is done. 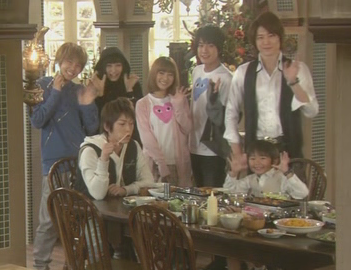 The last episode of Yamato Nadeshiko Shichi Henge has finally aired. I am sad to see this drama finished, it was a good comedy and the actors did a good job in taking on these popular manga characters. That said, I am a little disappointed in the conclusion to this drama. Oh, I am happy that Kyohei and Sunako got together (and Ranmaru and Tamao and Takenaga and Noi), but I didn’t care too much for the plot of this final episode. Kyohei still doesn’t want to admit that he’s worried about Sunako and that he really does love here. Sunako doesn’t want to admit that she’s in love with Kyohei because she’s afraid of love. Takenaga is afraid to tell Noi he likes her because he doesn’t know if their feelings will change somewhere down the road. Oddly enough, babyish Yukinojo has the upper hand in this episode as being the only one with a girlfriend and he actually is giving all the others realistic advice on love. I like Yukinojo, but his babyishness is still annoying at the end. Ranmaru has finally managed to grow on me and I like the evolution of Takenaga’s character into one that isn’t quite so serious and who shows his emotions more. Yukinojo’s test to see if Kyohei really does like Sunako. He starts listing off foods and Kyohei replies if he either likes it or hates it, then Yukinojo says Sunako’s name and without thinking or hesitating Kyohei says he loves her. Sunako’s voodoo doll of Kyohei. Whenever she got mad or upset because Kyohei was the only bright creature, she starts banging and beating up a Kyohei doll. Kyohei actually manages to block 2 headbutts. The first with his hand (but Sunako sucker punches him instead), the second one by shoving the skull Sunako gave him in front of her face. Takenaga telling Noi that he isn’t good with love, so let’s just be friends. My thoughts: I did thoroughly enjoy the drama and each episode kept me wanting more and anxiously awaiting the next airing of the drama. For the most part, I am happy with how things ended, but I didn’t like the overly dramatic finale. A mysterious character shows up, Greg, saying he is there to pick up Sunako and take her back to Africa to be with her parents. Neither Kyohei nor Sunako say how they really feel, upsetting the others of the house, especially Yukinojo. Apparently Greg is in dire need of money, but Sunako’s aunt refuses to help, so he kidnaps Sunako. Then Kyohei (after getting the money) hears that Greg is involved in fashion shows where the models are sold overseas (basic human trafficking). This causes him to panic, especially when he gets the call from Takenaga saying that Noi was with Sunako at a fashion show. The four boys rush off to save the day. Takenaga safely rescues Noi, but as Kyohei was getting ready to rescue Sunako, Greg grabs her and pulls out a gun (the episode begins with a nightmare Kyohei has of Sunako being pursued by a strange man while he is unable to move to help her and then the man kills her) and holds Sunako hostage. Kyohei freezes, but then begins screaming and crying begging Greg not to hurt Sunako, to take him instead. I had a suspicion that this whole fashion show human trafficking ring wasn’t all it was cracked up to be, but I actually hoped I was wrong. I wasn’t. This was all a stunt pulled by Yukinojo, Takeru, and the landlady just so Takenaga and Kyohei could realize their feelings and take action. I understand the sentiment. When you are close to losing something you love, only then sometimes do you understand just how much you’ll love and miss that something once its gone. However, I thought it was too drastic and dramatic. The end here did not justify the means at all. If I was Kyohei, I would have hit Yukinojo (after overcoming the horrific shock). But, it was a great drama with a good evolution of the characters. They are still flawed, still have their complexes, but they are all beginning to move forward step-by-step, instead of being caught up in their pasts and who they used to be. The OST for this drama is really great, too. I especially like the theme song sung by KAT-TUN, “Love Yourself.” It really fits in well with the drama, especially with the end with Kyohei telling Sunako that he loved her just the way she was. Inspiring, funny, with some great wit and action. This is a must see, must have drama. This drama has such a sweet kiss! For a jdrama, it did have a nice kiss scene. I loved it at the end how Kame got her to look at the skull and then went in for the kill.